The fast-acting AquaActiv Algaecide restores the health of your pond by preventing green water and algae growth. A 18 oz. bottle treats ponds up to 5,320 gallons. 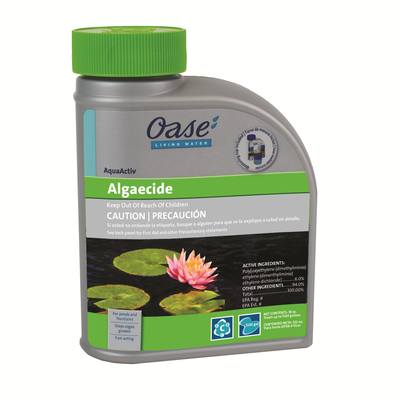 AquaActiv Algaecide Ponds & Fountains prevents and stops algae growth—solving one of the most common dilemmas of pond and fountain enthusiasts. A 18 oz. bottle treats ponds up to 5,320 gallons. When green water or algae appears, simply add Algaecide Ponds & Fountains, and watch the fast-acting solution make algae and shades of green disappear. It is safe for aquatic plants and animals as well as wildlife and pets.